The Papal Prayer Intention for April is that economists may have the courage to reject any economy of exclusion and know how to open new paths. In May 2016, Pope Francis addressed delegates attending the International Conference of the Centesimus Annus Pro Pontifice Foundation. 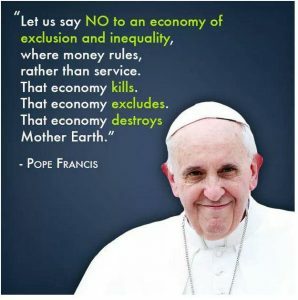 Here are some extracts from that speech that will help us reflect on the current Papal Prayer Intention for April that economists may have the courage to reject any economy of exclusion and know how to open new paths. An economic vision geared to profit and material well-being alone is – as experience is daily showing us – incapable of contributing in a positive way to a globalisation that favours the integral development of the world’s peoples, a just distribution of the earth’s resources, the guarantee of dignified labour and the encouragement of private initiative and local enterprise. An economy of exclusion and inequality (cf. Evangelii Gaudium, 53) has led to greater numbers of the disenfranchised and those discarded as unproductive and useless. The effects are felt even in our more developed societies, in which the growth of relative poverty and social decay represent a serious threat to families, the shrinking middle class and in a particular way our young people. The rates of unemployment for the young are not only a scandal needing to be addressed first and foremost in economic terms, but also, and no less urgently, as a social ill, for our youth are being robbed of hope and their great resources of energy, creativity and vision are being squandered. The Second Vatican Council rightly pointed out that, for Christians, economic, financial and business activity cannot be separated from the duty to strive for the perfecting of the temporal order in accordance with the values of God’s Kingdom (cf. Gaudium et Spes, 72). Yours (delegates) is in fact a vocation at the service of human dignity and the building of a world of authentic solidarity. Enlightened and inspired by the Gospel, and in fruitful cooperation with the local Churches and their pastors, as well as other believers and people of good will, may your work always contribute to the growth of that civilisation of love which embraces the entire human family in justice and peace.